Today recycling has become one of the key topics in the last years because of the increasing amount of waste and the waste itself is already an important resource of raw material. The amount of polymeric waste has increased significantly over the last decades, especially. 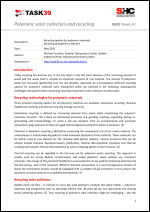 As a consequence different recycling options for polymeric materials were established which are outlined in the following. Subsequently challenges and opportunities concerning recycling of polymeric solar collectors are discussed. --- IEA SHC Task 39 is dedicated to the development, optimization and deployment of materials and designs for polymer based solar thermal systems and components. To increase the confidence in polymeric solar thermal applications, Task 39 actively supports international research activities and seeks to promote successful applications and state-of-the-art products. For the SHC conference 2013, different polymeric components suitable for domestic hot water preparation and space heating were singled out for an exhibition. Promising polymeric collectors, air collectors, thermosiphons, storage tanks and other components from industrial partners all over the world were brought to Freiburg and assembled at the Fraunhofer-Institute for Solar Energy Systems ISE. The resulting SHC Task 39 Exhibition of polymeric components shows the feasibility of all-polymeric solar thermal systems and highlights their potential, especially as scalable and modular applications for building integration or as export products to sunny regions.